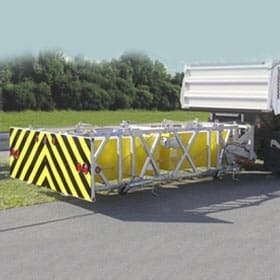 The SS90 HD is a heavy duty, truck mounted attenuator for use on stationary or moving shadow support vehicles. This TMA has passed all mandatory and optional testing and is NCHRP 350, TL-3 compliant. The SS90 HD helps absorb rear-end design impacts at speeds up to 62 mph. The SS90 HD is comprised of two lightweight, replaceable, energy-absorbing aluminum cartridges contained in a potentially reusable galvanized support frame. Mounting options include a socket hitch and tailgate mount.